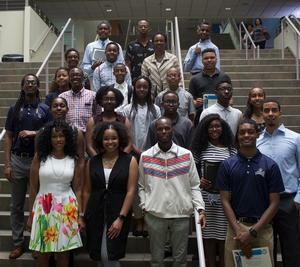 HAMPTON, Va. (July 10, 2018) - Hampton University wrapped up their annual Business of Engineering summer camp on June 30, 2018. The camp was filled with high school students practicing projects that demonstrate the interdependence of engineering and business. Throughout the program, students were challenged with real-world decision making, using valuable techniques within the fields of business and engineering in making real-world choices. They were introduced to the engineering methodology of the entertaining, yet challenging world of engineering. Students participated in design contest, case studies, and educational field trips. The program challenged students to make decisions exercised in engineering and business projects that affect their daily lives. It is anticipated that when these students make decisions about their college careers in the future, they will have a better understanding of what to expect in their respective career paths. In just two weeks, the Business of Engineering program engaged students through collaborative and interactive activities, and challenged students through the exposure of problem solving techniques. For more information about next year’s Business of Engineering summer program, go to http://busofeng.weebly.com/.